Tremendous change is all around us as a new era in our nation’s leadership begins. Now more than ever, we have reason and opportunity to look at the diverse fabric of our country. Even in covering the cacophony of the current political chorus, the media reminds us of myriad voices present in this land of ours which, over the past eight years, has seen historically marginalized communities move to the fore, asserting themselves, and taking a seat at the American table of public and private leadership and discourse. So today, when a ruling neoconservative sensibility calls for a return to "American Greatness" that call is met with resistance from a swath of the enfranchised who see such calls as a thinly veiled effort to mute newly emergent voices. Such efforts are also the monsters that threaten our democracy. This is why this Multicultural Children’s Book Day (MCBD) is so important. Multicultural Children’s Book Day 2017 (1/27/17) is in its fourth year and was founded by Valarie Budayr from Jump Into A Book and Mia Wenjen from PragmaticMom. These sisters' mission is to raise awareness on the ongoing need to include kid’s books that celebrate diversity at home and school bookshelves while also working diligently to get more of these types of books into the hands of young readers, parents, and educators. The movement to increase diverse reading materials for developing minds is gaining momentum that must not be lost. Amid the discord of political transition, multicultural literature offers us all a means to see, hear and learn from the other's experiences. Through books, we can build sorely needed bridges of understanding. That's why these books matter. There’s too much at stake in cultivating the perspectives, messages and the net effect of such work on developing minds, our citizenry and our democracy's place in the world. With this in mind, I have the honor to again participate in the daylong event that resounds all year long. 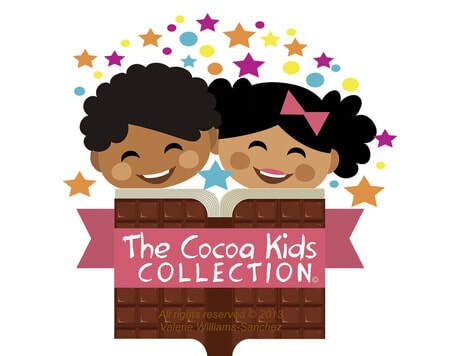 This time, I am both author of the Cocoa Kids Collection Books and a reviewer of a work by one of my peers (I received no compensation for the following). I invite you to check it out as well as the many other participating works, and encourage you to write and #ReadYourWorld! When it’s time for young Gladys Elizabeth Barbieri to go clothes shopping, she imagines hers as colorful, fancy and new with a wide flowing skirt and frills. So, when her mother heads for the clearance rack and picks what young Gladys considers the ugliest frock in the store, not just for her but with a matching one for her little sister, too, it’s all too much for young Gladys to bear. Disappointment turns to resentment that young Gladys directs squarely against her younger sister, Annaliz. Gladys sets out to rid herself of her younger sibling, devising schemes to find her another home anywhere else. Fortunately, their ever-present and watchful mother, who only wants her two daughters to get along, dashes one, then another of young Gladys’s crafty plans. One night, nightmares of green monsters scare young Gladys awake. And when it’s her little sister who comes to the rescue it marks the start of a friendship. Gladys comes to appreciate her little sister’s bravery; and, the younger sister attributes her bravery to the example Gladys unknowingly has set. Monster Slayer is a wonderful tale that raises issues to which anyone with siblings can relate. Author Gladys Elizabeth Barbieri writes in the first-person, an easy to understand tale about the challenges of having a sister. Lina Safar beautifully illustrates the story with dreamy watercolor pictures that bring the tale to life. Translated by Liliana Cosentino, the book is a bilingual, page-turner that is based on the author’s childhood remembrances. It is also a Moonbeam Children’s Book Award-winner, published by Big Tent Books, Savannah, GA. Looking for a child’s take, I shared the books with friends and family of Miss Angelica Grace Heyward, 4, who also enjoyed the tale – once she made it past the book’s “scary” title. There were many other reasons Angelica enjoyed the book, her mom said. 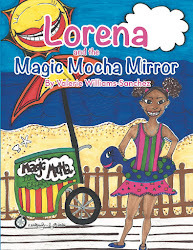 "She loved that the Mommy was buying the niñas a new dress," Doris told Valerie's Vignettes. "She loved the flamenco dress, and the colorful ballet folklorico dress, but hated the Carmen Miranda dress. She felt sad for the little sister because her oldest sister did not want to share a room. But was happy when she saw them sleeping together." In the end, Angelica's review was positive. "She loves the book," Doris said, "and wants me to read it over and over again." In addition to the works of Gladys Barbieri and mine, Multicultural Children's Book Day 2017 announced that it is honored to have several Sponsors for this year's event.